July's Space Babe is pretty Japanese actress Yûko Asano, plucky astronette of Toho Studios' 1977 space opera, The War In Space. As Jun Takigawa, the token female crewmember aboard the Earth spaceship Gohten, she was pretty much destined to be kidnapped by the evil Supreme Commander Hell of the alien space battleship Daimakan ,and his Wookiee-like, battle axe-wielding, "Space Beastman." Also inevitable, of course, was the alien leader forcing her to wear a skimpy leather slave outfit. An award-winning actress and singer,Yûko Asano was born on July 9th (coincidentally, my own birthday!) in 1960, and has had a prolific career in film and television in Japan. The main thing I came away with from this movie was how they hyped the hell out of The Random White Guy but then he dies randomly and suddenly. Seriously, what the hell was that about? 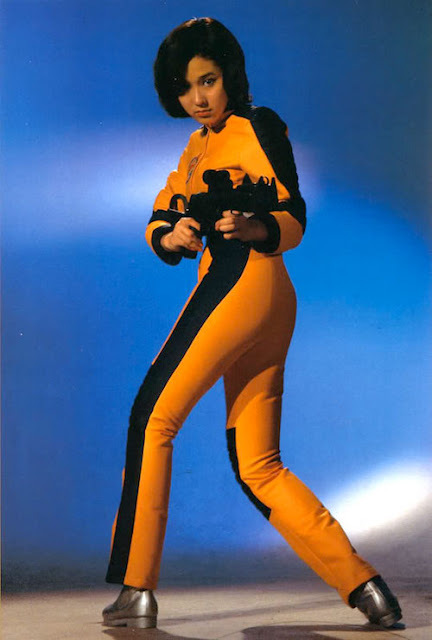 Her Yellow and Black outfit is an obvious nod to Bruce Lee in his final film "Game of Death"
Still have not gotten around to seeing War in space, but want to at some point. Have heard mixed reviews on it, but the uniforms, ships and that hairy guy with the horns make me want to see it for myself. The War In Space is goofy fun, made by the Godzilla folks. I like it a lot!